The favoured mount of Charlie and Ewan on Long Way Down but that isn't why I bought one (honest). No siree. I bought it because it was making enticing noises to me in the showroom. The spark of interest in a GS was originally ignited when I trawled through the Touratech catalogue looking for bits for the TT600 RE. Couldn't find any. But the GS had pages and pages of accessories. The (slightly skewed) logic was that a serious traveller needs serious kit which is really a load of old tosh. But the clincher was when I test rode the GS at Tayside BMW in Dundee. It really handled nicely, especially the front end which just instils confidence. I then got completely carried away by the big red Adventure that was sat dominating the showroom. I'm not sure if I made a wise choice. A standard GS would have been pretty much what I needed and with last year's stock still sitting there I could have picked one up at a reasonable price. One thing the Adventure has offered though is tank size. On the Six hundred miles plus from Aberdeen to Southampton I filled up twice, but with a full tank on departure that would have been once. A critic of this might say that you can't ride so far without a rest, but that isn't the case. We're talking survivable serious distance with a slight numb bum here. The second thing is that it offers superior wind protection with the bigger screen which adds to that ability to comfortably cover distances. It also has lots of buttons to play around with. 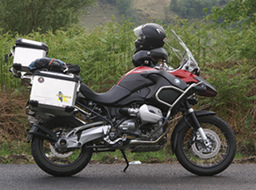 Touratech Screen Extender: Tips the wind that bit higher and particularly good on long motorway trips. But will the screen snap above a hundred? Not yet. Nippy Normans front fender extenda: Cheap and effective, keeps the engine a bit cleaner. Touratech sidestand plate: This is a very useful addition although the standard sidestand isn't microscopic. But loaded up in any conditions (including a monsoon in Switzerland) the bike has remained upright. Touratech headlight guard: I think over time this will make sense but it hasn't done anything yet. Touratech headlight eyebrows: Erm. I got a bit carried away. Starcomm intercomm: This is a brilliant bit of kit. Two up chattering at just about any speed. Till she got fed up and told me to shut up. BOS Exhaust: This has smoothed the whole plot out and increased power somewhat, but for a old wuss like me that isn't too much of a benefit. The sound is nice too. A bit like a lone Heinkel skimming the White Cliffs of Dover and bolting for France. Oh yes – and it backfires like my old Dad on sprouts. Zebra tank panel paint job: No, sorry, only joking. Sorry Ewan. The original seat height is seriously high. You might need a Sherpa to get up there. The standard GS is quite a bit lower and putting a lower seat on the Adventure means opting for a harder seat. Numb bum vs fall over. All GS's drink oil. It's a well documented feature and there are various bits of advice around like don't fill them right up, let them get to the bottom of the sight glass then just top small amounts in. Some mechanics think that they gulp the difference between the top of the glass and the bottom then sip thereafter (I would say a bit like me and red wine consumption but I'd be lying). I've tried this and think it might work but it is still work in progress sussing it out. You've got to put Castrol 20W50 Activo oil in. The dealers recommended this to me but the only place I've found to buy the damn stuff is on e-bay. It's just not practical if you are covering long distance in other countries. I've read that just about any 20W50 will be OK and have just tried to find a trustworthy source when it comes to buying on the road. I'm taking a litre of Activo on the North America trip for starters and we'll see how we get on. There aren't any fuses: This really got me first time out when I headed over to the North West 200. The handlebar heaters ceased to work and it was a chilly old evening. I phoned the dealers and they gave me the perfect IT solution: switch it off'n on again mate. Worked too. I think the computer works out that everything is OK and resets itself. It has happened twice in a year. Other than that it answers to 'Mutley' and I am liking. I think I love it long time. By the usual measures of motorcycling in the UK, addicted as we are to speed and sports bikes or cruisers, the TT600 RE would probably be judged as pretty useless. But in the desires of average 'Ned' (a Scottish cousin to the English 'Chav') it is a highly nickable vehicle of choice. Stolen twice and with another two serious attempted thefts the white and blue boomerang always manages to return home. With style. On the first theft it returned with the burnt remains of the 'Ned's' track suit bottoms and a bit of leg as crackling on the exhaust pipe. It's like Silver' in the Lone Ranger. The filthy Ned rides off back to his lair in the Northfields estate but with a whistle from the Ranger the villain is thrown and 'Silver' returns to his rightful place. Other than that it would probably get passed over quite quickly in the choice of mount. It is very slow, a bit too heavy for serious off roading (like its XT600 E predecessor), gets a bit flappy above 80mph and, whilst it handles quite nicely I think there are a lot of better candidates for the super-motard treatment. And I hope never to have to sell it. The result is the TT. Built in Italy with the good old XT air cooled engine in it but with a fair dollop of Italian flair in the design and build. So it came out a bit more serious dirt looking than the old XT and with much nicer welding and frame design. The detailing is really nice in comparison: proper chain adjusters, alloy swing arm rather than steel and the same for the wheel rims. All in all a really nice looking snail. Oh, and you can check out the oil level without having to remove covers from the front of your tank (a la XT) even if it is just as quick to trick you into overfilling it. It also did fairly well on a 4,500 mile trip. Nothing went wrong and it had the good grace to get a puncture on the 4,499.9th mile. Now that's what I call accommodating. Climb off at my house and the tyre sighs and deflates. The XT engine might be dog slow, but I'm a big fan of it having owned an old XT 600 E previously. 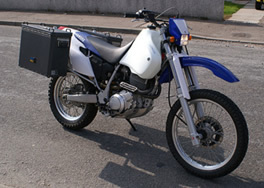 It's renowned for its reliability and has been used by many adventure motorcyclists plugging round the World. It returns around 48 - 55 miles per gallon and can chug along at 70 all day long with a little bit in reserve. I've tried to see a hundred on the clock but never succeeded - 95 is the best I've managed (a smaller person might see a hundred). The finish and detailing are quite nice and I think it looks the business. The seat is a bit uncomfortable and it definitely isn't designed for two up riding. The original tank is ridiculously small. Acerbis Tank: This adds a lot to the range of the bike taking it somewhere near two hundred and fifty miles I think. It also looks good too. The only criticism I have of it is that the petrol cap occasionally leaks (it is Italian after all), and with a full tank of fuel it seems to sometimes cause the carb to overflow. I've never got to the bottom of why. The mechanic couldn't make it replicate so I don't know if it is a problem with the carb or not. My theory is that there is a different weight of flow to the carb and this is somehow bypassing the breather pipe. The science behind my theory is that it leaks if I leave the tap switched on when the engine is off and it never leaks if I switch it off. Oil Temperature Gauge: I bought this off e-bay. It's a German gauge that costs about £45 and I got it for £15. In really hot climates the engine can get very hot and the Oil expands in the tank (see the European trip for a better description of this saga). I think if I'd had the gauge I would just have come to the conclusion the engine was about to melt but I did read on one website where two XT's expired in a desert just due to heat exhaustion and I believe it. This thing is just a bit of bling really though. Elastic Cargo Nets: These are just the business. Stretch and go. Never be without at least two. Your missus can do her hair in them at night too. Credit Cards: Are better than debit cards because it is the banks money you're spending. Well really it's the Governments after the bailout. In fact it's our money, we paid the taxes... forget I mentioned anything. Use the Post Office Bank because they don't charge you for foreign currency transactions. Strangely they are based in Dublin. I made an application to them and they lost it. The main thing is if you get your card or identity stolen and let the bank know in time (if it's still there) then you don't lose the money, they do because the credit card money is their's. I know this because someone stole my identity. Gawd knows why they wanted my identity but they did. And they had the bare faced cheek to move me (in a virtual sense) to Dagenham of all places! Having now been associated with Fordtown no-one will lend me any money anyway so it's all academic these days. Outcast from society am I. Big Agnes is a tent but that is the only accurate descriptive part of her name. In fact she's dimensionally challenged. She was purchased in the Mountain Equipment Co-op in Calgary during a work trip. The benefit of buying a tent in Canada is that you get it for about half the price it would be in rip off Britain. It is always a good idea to practice putting a tent up in your back garden before trying it out for real and Agnes was a case in point. Pretty confusing I would say. That's because a man had the instructions and a woman was taking instructions. Men don't read instructions. They get impatient and skip bits. The result is often pants. Once the woman took over the instructions the tent was up in a jiffy. Agnes is a beautifully constructed work of the tent maker's art form. Made in China. It has colour coded clips on it which make getting the flysheet on in the right position a doddle. It is also quite lightweight and compact for a 3 person tent. Not that you would ever get 3 people in. 3 hobbits might have a sporting chance though. Security wise it might not stave off a Ring Wraith though. Having tested the rain and flood resistant properties of the tent in Switzerland, which were excellent, we determined that it needed a bit more space for luggage and bought the extension porch. I wouldn't say this transforms the tent but it does make it a bit more amenable to spreading oneself out a bit or holding an eleventy first birthday party for Bilbo. We tested the cold weather properties of the tent at the Touratech Travel Event in Wales where it apparently reached minus three. I swear that I very nearly died. It has the thermal properties of a Polar Bear's paw print. Post USA/Canada trip report.... As you can see from the picture, Agnes the tent had quite a challenging time in America and Canada. 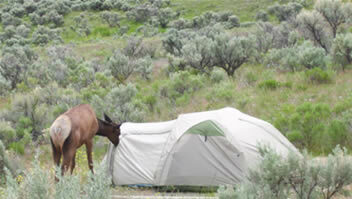 This culminated in an outrageous attack by a young elk which resulted in the tent being covered with elk drool. A few weeks later the tent gave up the ghost and expired on Vancouver Island. Suffice to say it didn't cover itself in glory having lasted a mere 28 days of camping in total. So, to conclude, I can't really recommend the Big Agnes tent for serious bike touring; it just isn't heavy duty enough. The lesson is that you shouldn't just buy the most expensive bit of kit where tents are concerned just select very, very carefully. Better to spend less on one if you know you can ditch it and pick another one up cheap!